Most people think the Nazis betrayed a trusted ally June 22, 1941 when they launched "Operation Barbarossa." In fact, Stalin was planning to attack Hitler almost as soon as the ink dried on their non-aggression pact August 23, 1939. Stalin told military academy graduates May 5, 1941: "And now after we have become strong... we must shift from the defensive to the attack." He had nine million men, 38,000 tanks and 22,200 aircraft and expected to be in control of Berlin and most of Europe by the end of 1942. At some point, Hitler realized Stalin intended to stab him in the back while he was occupied against England. Churchill and Stalin, both Freemasons, had a secret pact. Just read (Soviet ambassador to London) Ivan Maisky's "Memoirs" to see how chummy the British and Russians were even while the latter were in bed with Hitler. Magenheimer suggests that Hitler's final decision to attack Russia was prompted by Russian support of an anti-Nazi military coup in Yugoslavia in March 1941. Clearly Stalin was fishing in Hitler's pond. Magenheimer says that "Operation Barbarossa" was "decisively influenced" by this aggressive Soviet posture. Stalin's demands "were not only unacceptable to Germany" but reinforced "the impression that Moscow posed a long-term threat." 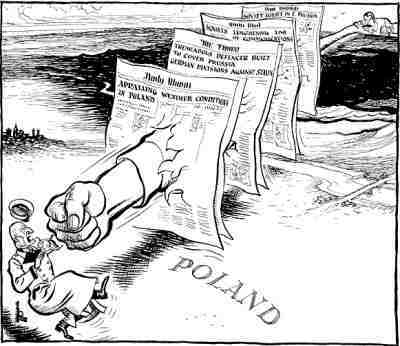 Germany gave up on attempts to bring the USSR into a "continental bloc" against Great Britain. In 1939, Stalin started to build a "Polish Red Army of Liberation" from the ranks of Polish POWS. They were to liberate Poland from the Nazis and provide the nucleus of a Communist regime. He overestimated the power of brainwashing. The mainly Catholic Poles refused to cooperate and that's why roughly 15,000 officers were shot at Katyn Forest and elsewhere in April-June 1940. The questions remains: If Stalin was prepared to attack Europe, why did he passively endure Hitler's devastating invasion? He had plenty of warning yet didn't launch a pre-emptive attack as his generals advised. He threatened to shoot anyone who took precautionary measures claiming Hitler would see them as provocations. He insisted Hitler wouldn't start a two-front war and was only bluffing. If we believe FDR's dictum that nothing in history happens by accident, were the massive Russian loses (20 million dead) and extended Nazi supply lines part of some secret plan? WHY DON'T WE HEAR ALTERNATE VIEWS? In 1990, Viktor Suvorov revealed Stalin's plans in his book "Icebreaker" but he was considered a maverick. Using post-Glasnost archival material and research, Magenheimer confirmed that Suvorov was indeed right. We don't hear that Stalin intended to displace Nazis hegemony with his own because "Uncle Joe" was our ally, and Communism was a dialectical model for the New World Order. History is a form of brainwashing. The programming calls for Hitler to be a homocidal maniac intent on eradicating all Jews and taking over the world. Thus Hitler's stigma can be transferred to anyone who opposes Zionist power and control: nationalists, racialists, and religious, Palestinians Taliban etc. all become identified with "Islamo Fascists." Thus we are primed for the next new world order war. A view that showed the Judeo-Masonic Money Power (that controlled England, the US and USSR) conspiring to destroy Germany; and Germany possibly using Jewish genocide in revenge, interferes with this programming. on Nazi Germany in 1933, it didn't consider half a million German Jews who would immediately become prisoners of war. Eventually most European Jews became hostages and pawns in a game played by a few. Alexander Solzhenitsyn's book about the Jewish role in the Bolshevik Revolution and after, "Two Hundred Years Together" (2003) also interferes with holocaust mind control. It documents the disproportionate role ethnic Jews played in the Russian Revolution and subsequent genocide of 66 million Russians under Lenin and Stalin. "Solzhenitsyn states that Lenin had three reasons for elevating young secular, revolutionary-minded Jews to the State's elite, in effect replacing the Tsarist bureaucracy. First, because of the deadly hate the young Jews had for Russian traditions, religious rites, historical models, hate for everything Russian and Russia itself. Second, their willingness to cross the last taboo borders in morality. And third, their readiness to physically liquidate the enemy." Stalin put Jews in charge of some of his nastiest work, and then catered to popular sentiment by liquidating them. "Such was the case in the murderous collectivization program in 1928-1933 to which the names of prominent 'Jew Bolsheviks' were attached. Stalin was well aware of the hate city Jews had for everything related to the Russian and Ukrainian peasantry. They spread terror, killing the peasants and destroying the villages; eventually causing the famine that took the lives of at least six million Ukrainians. The Jewish commissars in charge of the anti-kulak program, which was tantamount to genocide, were literally the masters over life and death." Thus, while many Jews such as my grandparents were innocent victims of Nazi terror, Bolshevik Jews were perpetrators of terror. This acknowledgement would interfere with the "guilt trip" (charge of anti-Semitism) used to advance the Zionist agenda (and keep Jews in line.) How dare Zionists accuse political opponents of "hate"? It is a disingenuous and juvenile psychological trick to paralyze opposition. Zionists who assign a ridiculous collective responsibility to others would have a lot to answer for themselves. Our era resembles the 1930's when people lived in constant dread of an upcoming world war. War was very unpopular in 1939 but our misleaders managed to engineer one anyway. Bush cannot win a guerrilla war in the Middle East and is planning a nuclear one. The pieces are all in place for escalation. An "Iranian" attack on a US ship; an Israeli strike on Iranian nuclear facilities; an "Iranian" (terrorist nuclear?) attack on Israeli or American cities; the imposition of martial law and dictatorship in the US. Who believes Bush and Cheney aren't capable of this? Frankly I am depressed by this prospect. Setting the historical record straight is one way I have of responding.